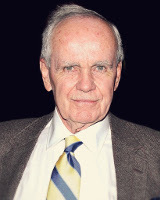 Cormac McCarthy 20 July 1933 American Charles Joseph McCarthy Gladys Christina McGrail McCarthy T.V Writer, Novelist, Playwright American novelist, playwright and screenwriter, he has written ten novels. His fifth novel, Blood Meridian(1985), got a place in Time magazine's 2005 list of the 100 best English-language books since 1923 and it's regarged as one of the greatest novels in Americian Literature. He won both the U.S. National Book Award and National Book Critics Circle Award. He won Pulitzer Prize and James Tait Black Memorial Prize for his fiction The Road(2006). A list of popular cormac mccarthy quotes are given below.